It’s the 3rd annual Favorite Things Christmas Giveaway! I’m sharing one here (wait till you see! ), plus you’ll want to click over to the other 14 wonderful bloggers to enter their giveaways too! What can you win from my giveaway this year? Some of my forever favorites, of course! Tropical Traditions – Coconut Oil and Palm Shortening Bucket! This giveaway will end Sunday, December 11 at midnight. I’ll draw a random winner Monday morning the 12th! Love all these giveaways! How fun! Thank you! Thank you for the chance to win! Love your blog! This is a great giveaway, thanks for doing it! This giveaway looks great! Cant wait to hear the results! What a fun give away! Thanks! We share some favorite things! Love your site! Merry Christmas! Merry Christmas, and thank you! You have been a mentor of sort to me over the years, God Bless you! I like your blog :) I , too, am striving to be a Heavenly Homemaker! Merry Christmas! Thank you for being a beautiful woman! Thank you for hosting this giveaway. It looks awesome! Oh, what fun it is to enter this lovely giveaway-aaaaaayyyy! Thanks. You have never steered us wrong, love all the products you suggest! Thanks! Would be so fun to win these awesome things! Thank you so much for thinking of us and giving us this great opportunity to win :) Have a Merry Christmas and Happy New Year !!! Fun! Thanks for offering this giveaway! Laura, I enjoy your blog. Thanks for a great giveaway. Really enjoy your sense of humor! Love reading your ideas, recipes, and antics ???? Thank you for sharing this info on other blogs, I am always excited to find another source for gluten free living. I just love your site, your encouragement, humor, and recipes. Merry Christmas to you and yours! These items look great. The coconut oil is my favorite. It looks like a fun give a way!! Going to make the pumpkin cheesecake whip right now! :D Great giveaway! Thanks for the opportunity! Thanks for giving us a chance to win awesome items!! I enjoy reading your posts. Keep them coming!! Merry Christmas!! All the prizes look great! Thank you for the opportunity to win! Thanks for the giveaway! I love seeing what other people’s favorite things are! I would love to win all of your favorite things! Thank you for sharing your wisdom and experiences with us everyday! Wonderful ideas. Thanks for sharing! I have never won but I always love this giveaway each year! Thank you for doing these awesome giveaways. These all look like great prizes to win! I have wanted to try palm shortening for a while–what a neat thing to include in the giveaway! So excited about all of these great offers! Such generous sponsors and bloggers!! Thank you! Love what you’re doing Laura! What a fantastic giveaway! There are so many wonderful items to win! Merry Christmas! Thanks for always sharing your life with us. Love your recipes and helpful hints! Hi! I just want to say that you are one of my favorite bloggers. Your posts are so real, encouraging, and full of usefulness especially in my walk as a homeschool mom of 6. Whoot! It’s always fun to see what my favorite bloggers choose for these favorite things giveaways! Such an amazing giveaway!!! And, scrolling through…your blog looks Packed with great info! Yay! These all look awesome! This would be one of the best Christmas present! Thank you!! Love giveaways! This is a great one! Love all the fun giveaways – thanks! Thank you for the giveaway! I love MadeOn! What a wonderful giveaway!! I would love to win. Thanks for the chance!! Awesome giveaways. Thanks I would love to win. Thank you, Laura for sharing all these special places and items with us this season. Appreciate your blog! Amazing giveaway, thank you! It will surely bless whoever wins! Oh what a great package of goodies – I hope I win! :) Merry Christmas!!! Love this annual contest. Thanks for participating! Great items. Thank you for your time. What lovely, helpful treats, thank you! I hope I win! I’ve been needing to purchase some vanilla beans to make homemade extract since my last one exploded and caught on fire! I love your gifts. Thank you so much for this awesome giveaway. What incredibly useful items! Thanks for the opportunity! Love that you’re giving away many of my faves — the BeeSilk products are THE BEST!! Love the items in your giveaway! Merry Christmas to your family! Thank you for such a great opportunity. I’m looking forward to seeing who wins . What a great Christmas !!! God is Great.. He knows needs before we do. I love Made On! I have wanted a Lila Rose clip for a while, too. I would love to win this package. Thanks so much for the giveaway! Thanks so much for offering this wonderful giveaway! Merry Christmas! I’m hoping I win this! It’s time for a new batch of vanilla at the Shackelford house! Would love to win these “favorite things”! These look great! Thanks, Laura. I would love to try the bee silk! Thank you, this is a wonderful giveaway. I see some new bloggers on this list that I need to check out! Great give-away! Thanks for the opportunity! Laura, Thanks for all you do! It always brightens my day when I read your posts. Love your giveaway choices! Tropical Traditions is a favorite of mine for products as well as information. Thank you for offering this for the third year in a row! What a special way to start the Christmas season! Thanks for the great giveaway! The Simple Meals subscription looks like a great resource! Who doesn’t love favorite things! Thanks for a great blog and a give-away, too! Great choices this year! Merry Christmas! Giveaways are such happy things!! Love Madeon! Good giveaways! thanks! This is a fabulous group of prizes! I’ve been wanting to try making my own vanilla so this would be a great jumpstart. I’ve been wanting to try the palm shortening, just found a great vanilla icing recipe I want to use it in! Love your blog!! Wonderful giveaway!! I’m looking forward to trying your recipes! Thanks for hosting- excited about the simple meal plan subscription! 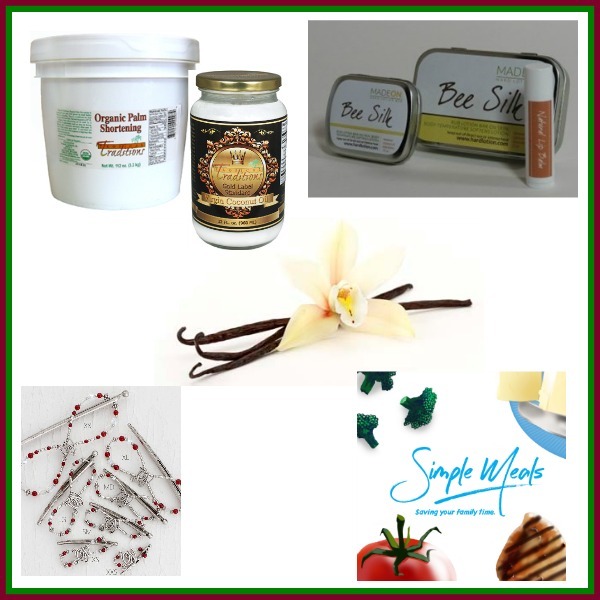 The vanilla beans would come in handy for the holiday baking. Thanks for hosting the giveaway. I enjoy your site and found some great recipes. Love that these are all things you love and blog about! Love your blog! Would love to win a free subscription. I regularly use your recipes. Thanks! Lots of good stuff I already use! Would love to win! Ooooooooooohhhhhhhh, it would be fun to win this! What awesome items! How exciting! Great giveaway! Enjoy reading your blog! Thanks for doing this again – it looks great! Your favorite things are some of my favorite things, too! Thanks for the fun giveaway! Thank you for a wonderful looking giveaway. Have a Merry Christmas and New Year! Your favorite things are all things I’d LOVE! Thank you for the opportunity to win! Love all the giveaways!! Exciting hoping for a win. Thank you for offering the free gifts! Blessing. Excited about the coconut oil! Thanks for the great giveaway! I need Cocunt Oil so this would be awesome to win! Thanks for hosting the giveaway!! Would love to try some of these products! I love looking at everyone’s favorite things, and I’ve even purchased some because of that! Have a blessed Christmas! Thanks for all these great ideas–and giveaways, too. Where in the world do you find the time to sort through all the stuff out there to pare down the offerings for us??? And your creativity–wow! Appreciate your whole site, and spirit. Thanks. What a wonderful and useful giveaway! I enjoy following your blog. I’d love to win just because of the coconut oil! Thanks for a great giveaway! Thanks for doing this giveaway! It looks awesome! Great giveaway!!! Thank you for the chance to win! Thanks for a great giveaway. Merry Christmas. I love your choices. Fun! Great giveaway (on all the blogs). Thanks! I would be so excited to try the lotion bar! My hands are crazy dry! So many wonderful favorite things! So excited to try your meal plans! I love favorite things posts and giveaways! I always learn about so many new fun products. Thanks for picking such great things! Merry Christmas! So many lovely giveaways from such lovely ladies! Thank you! Thanks ! Merry Christmas ! Love all these! Thanks and Merry Christmas! This is really a fun giveaway hop. Thank you. Awesome! So many great products. I really love Tropical Traditions as well. These all look amazing! Especially excited about the meal planning! I would love to win the Simple Meals subscription! Vanilla beans and palm shortening?!?! I really want this ! What a great giveaway! Hope you have a Merry Christmas! Thanks for keeping me informed through your blog! What nice prizes you have chosen. Fingers crossed! I love finding these new blogs to read! I’ve been reading your blog for awhile now and love what you have to share. Thanks for offering a great giveaway! Thanks for the giveaway. I enjoy reading your blog. Love all the short, simple recipes you give us that are delicious. Thank you for the chance to win these wonderful items! I love all of your favorite things–thanks for the chance to win them. Wow I love all of your favorite things! Would love to win your favorite things! Thanks for the giveaway… love your simple meals! what a great giveaway! Love your picks! Thanks for sharing such a great, encouraging blog. You are truly a blessing to so many. This looks like such a wonderful giveaway!! Love the giveaway. Thanks! Have a wonderful Christmas season with your family. Thank you for the great giveaway, and interesting blog posts the rest of the year. Thank you for offering this giveaway! I appreciate your recipes and tips. This is a really wonderful assortment of items; thank you so much for this opportunity! So many great prizes! Thanks for the giveaway! Hello, thanks for the chance to receive wonderful items, and a Merry Christmas to all!!!! i would especially like that coconut oil! thanks! Thank you for doing this giveaway! Tropical Traditions is a wonderful company. These look like great gifts! Thank you for this great giveaway! Merry Christmas!! I love your favorites too! Thanks for the chance! Thanks again for another wonderful giveaway! Wait…..you’re actually giving away vanilla beans??? That’s like gold right now! i’ve been wanting to get around to buying palm shortening for like forever!! Merry Christmas! I appreciate the giveaway! I would love to win this! Merry Christmas to me! I was just looking for a vegetable shortening alternative at Thanksgiving. If I will the giveaway, I will be excited to see how this compares! Thanks for the chance to win some nice things. I love many of Tropical Traditions products! I have flexi clips from LillaRose and I LOVE them! It would be so fun to win another one! Hope you and your family have a great Christmas!! Great Products! Thank you for the giveaway & the chance to win. Wishing you & your family a Merry Christmas. God bless. I’d love to win all these goodies! Thanks! What a wonderful opportunity to be introduced to other concepts, ideas and promotions. Thank you for all your dedication. What an interesting variety of goods! Thank you! Would love to win the Simple Meals membership! After we acquired our stash of flexis, I hadn’t looked at their site. Wow! A lot of fun new flexis and more! Thank you for hosting/doing this giveaway! Would love to win this!Thanks for the chance. Fun giveaway! I would love to try the lotion! I love the prizes in this giveaway! Thanks for the chance! Merry Christmas, Laura! Thanks for offering this give away! Great assortment of goodies! So hoping! Would love to win. Merry CHRISTmas!! Merry Christmas! Thank you for everything you do! Generous giveaways from some of my websites. Thank you for participating in this! Thanks for the fun and opportunity to win! Is it only for US participants? Yes, thank you for offering such great gifts! Merry Christmas! Thank you! Simple gifts, yet ones that would be treasured all year. Have a very Merry Christmas! Thanks for doing this giveaway! Like your blog! Thank you for this wonderful giveaway! Merry Christmas! I used to subscribe to you long ago, so I’m glad you’re having this giveaway for me to find you again. i’d love to win! I’m already dreaming of what I’ll make with those vanilla beans! Fabulous give away. Love your site! Lots of great recipes.Thanks for the opportunity to win.